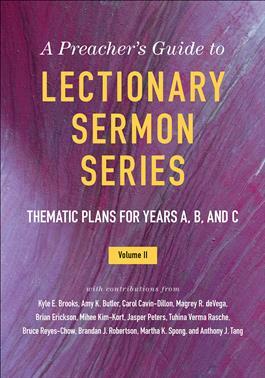 Both lectionary preachers and topical preachers will enjoy the best of both worlds with this second volume of sermon series ideas designed to frame consecutive weeks of lectionary texts into seasonal and short-term series. With contributors from seven denominations, this comprehensive resource offers new perspectives and fresh ideas for diving deep into biblical themes in ways that make congregants eager to come back for the next sermon and to invite others as well. Twenty-eight series plans include thematic overviews, sermon starters, and ideas for worship and outreach, honoring holy days and seasons and addressing typical patterns of church attendance to maximize visitor retention and member engagement. Contributors include: Amy K. Butler, Kyle E. Brooks, Carol Cavin-Dillon, Magrey R. deVega, Brian Erickson, Mihee Kim-Kort, Jasper Peters, Tuhina Verma Rasche, Bruce Reyes-Chow, Brandan J. Robertson, Martha K. Spong, and Anthony J. Tang.